I love this story because it’s all about how much old people have to offer (Yay, seniors!) and because I heard about it from a young friend of mine who was bragging about her mother (I can only dream…) I also love it because my dad used to volunteer teaching chemistry to young kids when he was in his 80s, and he saved their cute thank-you notes forever. It all started with sort of a selfish aim. Beryl Katz had a young son with intense ADHD, and he needed special attention in school. Yet the programs that kids like Mike needed were expensive, and seniors in the Council Rock, Pennsylvania district often showed up to oppose funding them. Beryl understood the seniors’ position, because her parents were living on fixed incomes, but she’d also been a teacher, so she knew the other side as well. So in 1999, she had a stroke of genius: if she could get seniors into the schools so they could understand the demands on the education system – and allow seniors to feel how important their help was– then maybe everyone could come together and support the schools. Beryl Katz went to the president of the school board, who loved her idea and thanked her for volunteering to run it. (gulp!) Undismayed, she pitched right in. Necessity may be the mother of invention but mothers are the people who invented doing something for nothing. To attract her first volunteers, Beryl invited all the seniors in the area to a free Thanksgiving lunch at the school cafeteria, followed by a free school play. Beryl got her first 75 volunteers to sign up to help in the classroom and she was off and running. 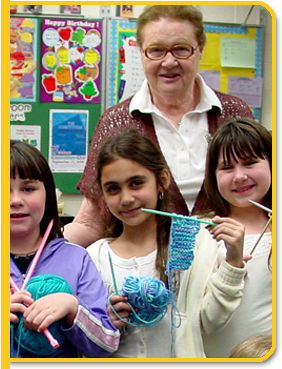 Ten years later, SAGE (Senior Adults for Greater Education) www.beasage.org operates in 35 schools with 175 volunteers. Along the way, Beryl has established great working relationships with teachers and principals, and drawn in local politicians, corporate bigwigs, and legal eagles that love getting involved in this innovative win-win program. Beryl still lets the seniors choose what they want to teach, then finds teachers who can use that in the classroom — from veterans talking about serving in WWII, to women whipping up costumes for school plays, to artists teaching sculpture. 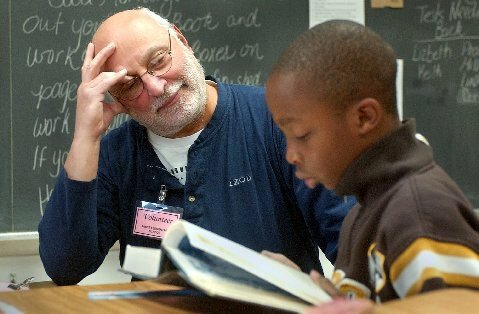 And both kids and seniors still benefit tremendously from the interchange: seniors are energized, engaged and valued for their knowledge; while recent studies show that kids with an older person in their life have a “protective factor” and are less likely to use drugs, commit violence, or drop out of school. Some of Beryl’s original volunteers are still in the classroom, and the Intergenerational Spelling Bee and Bingo Nights continue to be a huge hit. For her creative approach to bridging the generation gap and bringing a tremendous free resource into our schools, $100 goes to Beryl Katz for her “Be a Sage” program. HAPPY BIRTHDAY, BERYL!! We used to have a senior program at our school. Hummmmm, think I’ll check into this. Thanks for posting! I know who I’m passing this on to as well! If only more than 47 people could read this! Beryl Katz is an inspiration. She decided to be the change she wanted to see in the school district. Her example has inspired many others. Everyone–the teachers, administrators, schools, parents, children and seniors–have benefitted from her idea. Congratulations, Beryl for proving once again that an individual can make a difference. Congratulations, Beryl, on this wonderful award. How lucky this area is to have someone as dedicated as you are to making the world a nicer place to age and also getting younger generations and older generations together in a win win situation. You have done wonderful things for so many!!! shocked that our paths have not crossed again! working hard to do good-you and me. Beryl has made such a difference in our lives. Ron and I have been active in SAGE since its reception and we look forward to our weekly visits with “our” kids. Of course, not only do we see the elementary students, we have the pleasure of participating in classes at the high school level whose parents have never experienced some of the things that we have. We wish Beryl many more years of good health and good ideas for future SAGE projects. Thank you! I have the idea..it is those like you and Ron who are in there doing the work that truly touches lives of hundreds of students in our community. Beryl is more than deserving recognition for her selfless work in the schools. I admire her ability to accomplish the growth of SAGE in the past ten years, from an original idea to a vast organized volunteer group. and you are an inspiration and a pioneer! the idea couldn’t go anywhere without the volunteers…. I am one of the lucky teachers who have had the opportunity to work with Beryl and this wonderful program. It is a win/win situation. The students love having someone in the class who will not judge them, who helps them and the teacher has the experience and assistance to further the opportunity for learning to happen. I have made some wonderful new friends in working with the seniors. Every school should try to get SAGE in their building. Thanks for making it happen at Faust! Looking forward to getting moving in your new location! I love this story and I love this blog. What a grand idea on both counts! This story truly warms my heart. Considering the size of the soon-to-be senior community, there are going to be a lot of very intelligent meandering seniors out there with time on their hands! My favorite classes growing up were those in which a WWII vet or Holocaust survivor came to spend the day telling stories or sharing photos. 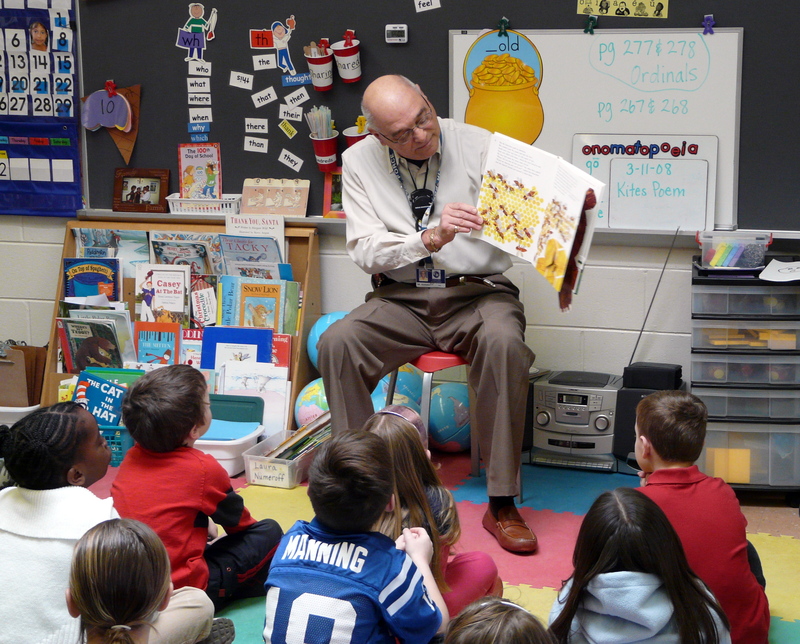 I recall the class being captivated and silent — something our “regular” teacher rarely received.